When you mow your lawn in colder months, it will not grow back as quickly. The combination of sun and humidity in the summer helps the grass to get to unmanageable lengths should you choose to leave it. By keeping it at a constant height and making mowing a habit, you should not have any problem when the warmer months start to make an appearance. This is just a basic step to give you a good grounding of what’s to come. Start planting any flowers and shrubs which require cooler weather and sow the seeds which need your attention during these months too. 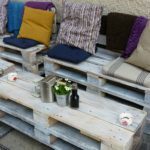 There is also the ever-increasingly popular choice of pallet furniture; this can be a great DIY project in the time leading up to summer, and gives you the chance to save some money and put your woodworking skills to the test. It can be made as big or as small as you would like, and painted to any colour to suit your garden. Other options include preloved plastic garden chairs or wooden benches which can be reminiscent of many a childhood. Visit your nearest re-use centre or tip shop to see what’s available. Choose a nice furniture set to go in your garden, with everything you need to be able to sit back and relax. You can view outdoor tables here, or further your search online for chairs, parasols and any other accessories that you can think of. Rattan garden furniture is always a big hit and never seems to go out of style; you can see it in pubs, hotels and a variety of different places due to its low maintenance and durability. You can read more about rattan and the environment here. Just because it’s outside doesn’t mean that it can’t be decorated. Any walls or fences that are available to be painted can be – and not just one colour. Try sprucing it up and experimenting with different colour schemes around your garden. You can match it with anything, from the colours of the flowers that are there to something completely wacky and out-of-character. The garden is a space that can be worked with and rejuvenated the following year to follow trend or whatever inspiration you want to follow. It is something that can be built up over time, so don’t fret if you don’t get it all done at once – you’ve got years ahead of you to do so!